498 pages | 155 B/W Illus. As today’s organizations are capturing exponentially larger amounts of data than ever, now is the time for organizations to rethink how they digest that data. Through advanced algorithms and analytics techniques, organizations can harness this data, discover hidden patterns, and use the newly acquired knowledge to achieve competitive advantages. Overall, the book reports on state-of-the-art studies and achievements in algorithms, analytics, and applications of Big Data. It provides readers with the basis for further efforts in this challenging scientific field that will play a leading role in next-generation database, data warehousing, data mining, and cloud computing research. It also explores related applications in diverse sectors, covering technologies for media/data communication, elastic media/data storage, cross-network media/data fusion, and SaaS. 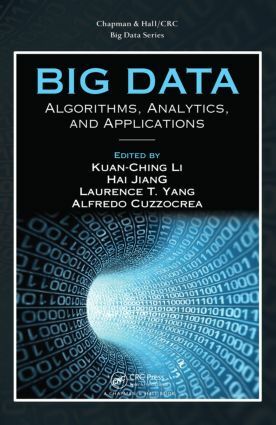 The collection presented in the book covers fundamental and realistic issues about Big Data, including efficient algorithmic methods to process data, better analytical strategies to digest data, and representative applications in diverse fields. … This book is required understanding for anyone working in a major field of science, engineering, business, and financing. The editors have assembled an impressive book consisting of 22 chapters written by 57 authors from 12 countries across America, Europe, and Asia. … This book has great potential to provide fundamental insight and privacy to individuals, long-lasting value to organizations, and security and sustainability to the cyber–physical–social ecosystem …. These editors are active researchers and have done a lot of work in the area of Big Data. They assembled a group of outstanding chapter authors. … Each section contains several case studies to demonstrate how the related issues are addressed. … I highly recommend this timely and valuable book. I believe that it will benefit many readers and contribute to the further development of Big Data research. Kuan-Ching Li is a professor in the Department of Computer Science and Information Engineering at Providence University, Taiwan. He was department chair in 2009, has been special assistant to the university president since 2010, and was appointed vice dean for the Office of International and Cross-Strait Affairs (OIA) in 2014. He earned a PhD in 2001 from the University of São Paulo, Brazil. Dr. Li is a recipient of awards from NVIDIA, the Ministry of Education (MOE)/Taiwan, and the Ministry of Science and Technology (MOST)/Taiwan. He also received guest professorships at universities in China, including Xiamen University (XMU), Huazhong University of Science and Technology (HUST), Lanzhou University (LZU), Shanghai University (SHU), Anhui University of Science and Technology (AUST), and Lanzhou Jiaotong University (LZJTU). He has been involved actively in conferences and workshops as a program/general/steering conference chairman and in numerous conferences and workshops as a program committee member, and he has organized numerous conferences related to high-performance computing and computational science and engineering. Dr. Li is the editor in chief of the technical publications International Journal of Computational Science and Engineering (IJCSE), International Journal of Embedded Systems (IJES), and International Journal of High Performance Computing and Networking (IJHPCN), all published by Interscience. He also serves on a number of journals’ editorial boards and guest editorships. In addition, he has been acting as editor/coeditor of several technical professional books, published by CRC Press and IGI Global. His topics of interest include networked computing, GPU computing, parallel software design, and performance evaluation and benchmarking. Dr. Li is a member of the Taiwan Association of Cloud Computing (TACC), a senior member of the IEEE, and a fellow of the IET. Hai Jiang is an associate professor in the Department of Computer Science at Arkansas State University, United States. He earned a BS at Beijing University of Posts and Telecommunications, China, and MA and PhD degrees at Wayne State University. His research interests include parallel and distributed systems, computer and network security, high-performance computing and communication, big data, and modeling and simulation. Dr. Jiang has published one book and several research papers in major international journals and conference proceedings. He has served as a US National Science Foundation proposal review panelist and a US Department of Energy (DoE) Smart Grid Investment Grant (SGIG) reviewer multiple times. He serves as an editor for the International Journal of High Performance Computing and Networking (IJHPCN); a regional editor for the International Journal of Computational Science and Engineering (IJCSE) as well as the International Journal of Embedded Systems (IJES); an editorial board member for the International Journal of Big Data Intelligence (IJBDI), the Scientific World Journal (TSWJ), the Open Journal of Internet of Things (OJIOT), and the GSTF Journal on Social Computing (JSC); and a guest editor for the IEEE Systems Journal, International Journal of Ad Hoc and Ubiquitous Computing, Cluster Computing, and The Scientific World Journal for multiple special issues. He has also served as a general chair or program chair for some major conferences/workshops (CSE, HPCC, ISPA, GPC, ScalCom, ESCAPE, GPU-Cloud, FutureTech, GPUTA, FC, SGC). He has been involved in 90 conferences and workshops as a session chair or as a program committee member, including major conferences such as AINA, ICPP, IUCC, ICPADS, TrustCom, HPCC, GPC, EUC, ICIS, SNPD, TSP, PDSEC, SECRUPT, and ScalCom. He has reviewed six cloud computing–related books (Distributed and Cloud Computing, Virtual Machines, Cloud Computing: Theory and Practice, Virtualized Infrastructure and Cloud Services Management, Cloud Computing: Technologies and Applications Programming, The Basics of Cloud Computing) for publishers such as Morgan Kaufmann, Elsevier, and Wiley. Dr. Jiang serves as a review board member for a large number of international journals (TC, TPDS, TNSM, TASE, JPDC, Supercomputing, CCPE, FGCS, CJ, and IJPP). He is a professional member of ACM and the IEEE Computer Society. Locally, he serves as US NSF XSEDE (Extreme Science and Engineering Discovery Environment) Campus Champion for Arkansas State University. Dr. Laurence T. Yang is a professor in the Department of Computer Science at St. Francis Xavier University, Canada. His research includes parallel and distributed computing, embedded and ubiquitous/pervasive computing, cyber–physical–social systems, and big data. Dr. Yang has published 200+ refereed international journal papers in the above areas; about one-third are in IEEE/ACM transactions/journals and the rest mostly are in Elsevier, Springer, and Wiley journals. He has been involved in conferences and workshops as a program/ general/steering conference chair and as a program committee member. He served as the vice chair of the IEEE Technical Committee of Supercomputing Applications (2001–2004), the chair of the IEEE Technical Committee of Scalable Computing (2008–2011), and the chair of the IEEE Task Force on Ubiquitous Computing and Intelligence (2009–present). Dr. Yang was on the steering committee of the IEEE/ACM Supercomputing Conference series (2008–2011) and on the National Resource Allocation Committee (NRAC) of Compute Canada (2009–2013). In addition, Dr. Yang is the editor in chief and editor of several international journals. He is the author/coauthor or editor/coeditor of more than 25 books. Mobile Intelligence (Wiley 2010) received an Honorable Mention by the American Publishers Awards for Professional and Scholarly Excellence (the PROSE Awards). He has won several best paper awards (including IEEE best and outstanding conference awards, such as the IEEE 20th International Conference on Advanced Information Networking and Applications [IEEE AINA-06]), one best paper nomination, the Distinguished Achievement Award (2005, 2011), and the Canada Foundation for Innovation Award (2003). He has given 30 keynote talks at various international conferences and symposia. Alfredo Cuzzocrea is a senior researcher at the Institute of High Performance Computing and Networking of the Italian National Research Council, Italy, and an adjunct professor at the University of Calabria, Italy. He is an associate professor in computer science engineering at the Italian National Scientific Habilitation of the Italian Ministry of Education, University and Research (MIUR). He also obtained habilitation as an associate professor in computer science by the Aalborg University, Denmark, and habilitation as an associate professor in computer science by the University of Rome Tre, Italy. He is an adjunct professor at the University of Catanzaro "Magna Graecia," Italy, the University of Messina, Italy, and the University of Naples "Federico II," Italy. Previously, he was an adjunct professor at the University of Naples "Parthenope," Italy. He holds 35 visiting professor positions worldwide (Europe, United States, Asia, and Australia). He serves as a Springer Fellow Editor and as an Elsevier Ambassador. He holds several roles in international scientific societies, steering committees for international conferences, and international panels, some of them having directional responsibility. He serves as a panel leader and moderator in international conferences. He was an invited speaker in several international conferences worldwide (Europe, United States, and Asia). He is a member of scientific boards of several PhD programs worldwide (Europe and Australia). He serves as an editor for the Springer series Communications in Computer and Information Science. He covers a large number of roles in international journals, such as editor in chief, associate editor, and special issue editor (including JCSS, IS, KAIS, FGCS, DKE, INS, and Big Data Research). He has edited more than 30 international books and conference proceedings. He is a member of the editorial advisory boards of several international books. He covers a large number of roles in international conferences, such as general chair, program chair, workshop chair, local chair, liaison chair, and publicity chair (including ODBASE, DaWaK, DOLAP, ICA3PP, ICEIS, APWeb, SSTDM, IDEAS, and IDEAL). He served as the session chair in a large number of international conferences (including EDBT, CIKM, DaWaK, DOLAP, and ADBIS). He serves as a review board member for a large number of international journals (including TODS, TKDE, TKDD, TSC, TIST, TSMC, THMS, JCSS, IS, KAIS, FGCS, DKE, and INS). He also serves as a review board member in a large number of international books and as a program committee member for a large number of international conferences (including VLDB, ICDE, EDBT, CIKM, IJCAI, KDD, ICDM, PKDD, and SDM). His research interests include multidimensional data modeling and querying, data stream modeling and querying, data warehousing and OLAP, OLAM, XML data management, web information systems modeling and engineering, knowledge representation and management models and techniques, Grid and P2P computing, privacy and security of very large databases and OLAP data cubes, models and algorithms for managing uncertain and imprecise information and knowledge, models and algorithms for managing complex data on the web, and models and algorithms for high-performance distributed computing and architectures. He is the author or coauthor of more than 330 papers in international conferences (including EDBT, CIKM, SSDBM, MDM, DaWaK, and DOLAP), international journals (including JCSS, IS, KAIS, DKE, and INS), and international books (mostly edited by Springer). He is also involved in several national and international research projects, where he also covers responsibility roles.